David Stanhope has been writing music for brass ensembles for over 30 years. This music is performed widely and is a favourite of brass players around the world. Sydney Brass is celebrating its fiftieth anniversary with the release of this recording. It has been performing and promoting brass ensembles in a variety of settings for 50 years, having been established by the Sydney Symphony’s long-time, now retired tuba player, Cliff Goodchild. He has passed the reins to his son, trumpeter Paul Goodchild. An ensemble of the best brass players on the Australian eastern seaboard has been gathered to make this CD, and the performances are “verging on ideal” according to the composer. The recording was made in the clear and supportive acoustic of City Recital Hall in Angel Place, Sydney. The works range from techically terrifying trombone quartets, to fanfares written for and first performed at recent Olympic Games’ ceremonies, to large ensemble works involving the addition of percussion. Stanhope’s writing for brass is Graingeresque, with an ear for melody and a deftness of writing that really suits brass instruments. Included as a bonus are some recordings from Stanhope’s personal archive in which he multi-tracked (with seriously ancient technology) french horn quartets and octets, many of which have been published and are tackled regularly by horn players round the world. The virtuosity required to perform these works is legendary. To hear Stanhope performing them is an astounding experience. Formed in 1958, the Sydney Brass marked their 50th anniversary in 2008. Originally made up of the brass section of the Sydney Symphony Orchestra, the ensemble is now composed of top symphony and freelance musicians from all over Australia. This terrific	CD is a great promotion for David Stanhope, one of Australia's most versatile and successful musicians. The disc features not only brass ensemble music composed or arranged by the Grainger devotee, but also conducted or performed by him on both horn and bass trombone. On it are works written for trumpet ensemble, trombone quartet, and horn ensemble, as well as for brass quintet and large brass ensemble. Everything on the CD sounds truly spectacular. The disc opens with The Australian Fanfare, a brief but rousing trumpet ensemble piece that showcases the trumpeters' impressive and sparkling sound. Also included are several of Stanhope's folksong settings, dedicated to the memory of Percy Grainger with their similar counterpoint and occasionally harsh dissonant harmonies. Three Folksongs for Brass Quintet is a catchy and entertaining work that could easily pass as a Grainger transcription. Its middle movement uses Rufford Park Poachers, a multi-metered tune used in Lincolnshire Posy. The highlight of the album for this reviewer is A Leadsman, a Lady & a Lord, another very exciting Grainger-like three-movement folksong setting. Originally written as a test piece for the British Band Championships of 1985, it is presented here with symphonic brass ensemble and percussion. It features gorgeous sonorities and very intricate canons. Another gem is Endpiece for large brass ensemble, a work that Stanhope himself describes as his "best piece of music," a "heartfelt tribute to Grainger." Using such folk tunes as Rufford Park Poachers and The Sussex Mummers' Christmas Carol, it features much poignant dissonance and even ends on an unresolved dissonance, leaving the listener wanting more. All of the works on this album are first recordings, with the exception of Three Folksongs. The brass playing and the recording quality is first-rate throughout – perfectly blended and in-tune, with an impeccably rich, full-bodied brass section sound. The attractive packaging includes nicely detailed liner notes. This CD is a must for all fans of great brass ensemble playing! Recorded at City Recital Hall, Angel Place, in Sydney, the opening tracks on this disc have Olympic grandeur. Olympic Fireworks was commissioned as an orchestral work for the Sydney 2000 Games and the grand melodies are played with aplomb. 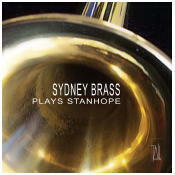 Sydney-based David Stanhope wrote all the music on this disc, performed by Sydney Brass to celebrate its 50th anniversary. The composer cites Percy Grainger as an influence, particularly in his folk-song settings. A sense of humour becomes apparent in Three Folksongs for Brass Quintet, with a few ridiculously low notes punctuating the harmony. It includes some beautiful muted trumpet playing. A more dissonant and dramatic style appears in Ceremonial Fanfares. A Leadsman, a Lady and a Lord shows off complex rhythms, majestic melodies and changes of meter. There are some delightful vintage recordings. These soundbites of a minute or so refer to, and sometimes make fun of, themes from well-known works such as 1812 Overture, Berlioz's Symphonie Fantastique and Beethoven's Symphony No 9.